The Bible includes any number of "tyrannical texts" that have proved to be profoundly oppressive in the lives of many people. Among them are Pauline texts that have circumscribed the lives and ministries of women throughout Christian history. What are people who honor Scripture to do with such texts, and what does it mean to speak of biblical authority in their presence? In Encountering God in Tyrannical Texts, Frances Taylor Gench provides strategies for engaging such texts with integrity—that is, without dismissing them, whitewashing them, or acquiescing to them—and as potential sources of edification for the church. Gench also facilitates reflection on the nature and authority of Scripture. 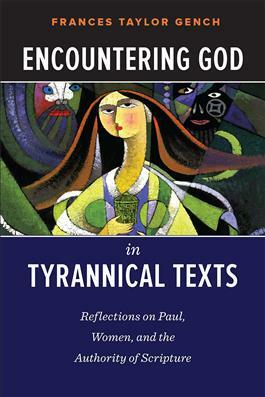 Encountering God in Tyrannical Texts provides access to feminist scholarship that can inform preaching and teaching of problematic Pauline texts and encourages public engagement with them. "Frances Taylor Gench tackles Paul's thorniest texts about women with trenchant criticism, in the best sense of the word. Steering a judicious course between blatant dismissal and blind acceptance, she honestly and respectfully assesses both the harmful and helpful dimensions of these passages for the body of Christ in Paul's day and ours. As useful as this book is, however, for understanding a set of controversial Pauline texts, it is even more valuable as a sterling model of biblical interpretation—of how to wrestle with God's word with full integrity. Written in an engaging personal style (this stuff really matters to Gench!) intertwined with first-class scholarly analysis, this work provides an ideal resource for seminary, university, and parish study. A must-read for men as well as women, guaranteed to stimulate much lively learning and discussion." "Frances Taylor Gench writes for those for whom Scripture is still a living tradition—or who wish that it could be. A scholar with a deep love for the church, she fearlessly takes on some of the most terrifying texts for women in the letters of Paul and proposes ways to respectfully engage them that do not minimize their dangers nor overlook their insights. I heartily recommend this accessible and engaging book for all who want to take Scripture seriously and are willing to dig deep and wrestle with it. They will not be disappointed."